For the past ten years or so I have used my trusty "Vinaigrette for the Week" recipe as my go-to salad dressing. And for good reason, as it is versatile and delicious. I have used different vinegars, added various herbs and spices, and changed up the combinations of oil and every single one of them has made for a tasty salad. 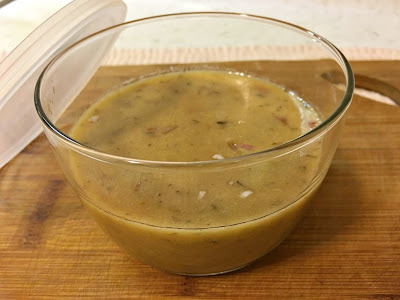 During that period I have also earmarked several new vinaigrette recipes that I have stumbled across that have variations I have not tried but seem interesting, but it has been such a habit and by now no-brainer to just keep making my usual dressing whenever I make a salad that I never think to try any of the new ones. So I am especially happy that my New Recipe Project has caused me to go back and look over all of those recipes that I have been collecting over the years with the specific intention of putting more of them to use. Add to that the lack of attentiveness at the grocery store that led me to pick up the container of baby spinach and greens instead of just the baby spinach I was intending to buy and throw that in my cart. I was not really planning for salad but I did not particularly care to saute the spring greens mix (although the thought did occur to me), so salad it was and I picked up some radishes, and tomatoes the next time I was at the store. Which meant I needed to make a dressing. Eager to make as many new recipes as possible for my project I went through my new recipes and found this Shallot Vinaigrette recipe I found in Bake from Scratch magazine. I always have shallots on hand for various uses and sherry vinegar for my favorite gazpacho so I decided to give this a try. And I think I may have found a new go-to dressing. The sherry vinegar has a more mellow profile than other vinegars to which the shallots provide a refreshing bite. And thyme enhances just about everything. A good fruity olive oil rounds out the flavor, and the ratio of oil to vinegar is than the vinaigrette for the week and that is an added bonus, as it is not lacking one bit in flavor. And this is one of the reasons I have been so eager to start using some of those hundreds of recipes I have been collecting over the years. Meet my new go-to salad dressing. Combine the vinegar and shallot in a small bowl and let sit for at least 20 minutes. Add the mustard and honey and whisk to combine. Stir in the thyme, salt and pepper. Whisk in the olive oil, making sure it is well combined. Cover and refrigerate for at least 2 hours before using.